May I Be of Service? May this Holyday season bring time to cherish all that is good and true and beautiful. May its dark days invite rest for reflection and renewal. May nature welcome you to its beauty, magic and wisdom. work and pastimes fulfill and affirm. May strength in body, mind and spirit allow you to embrace life’s uncertainties. May patience, love and kindness – given and received – be yours in abundance. The need to simply do quite a bit of not a lot. It’s a statement I typed in an email to a friend last week. Unbidden. True. I relish the sudden spontaneous emergence of such pithy truths. Like the time when I asked another friend for the gift of her skillful deep listening as I weighed a hefty matter needing decisive action. “Winnowing to essence,” came my reply, as I described the simplicity I was after. Since then, those words have become a mantra for the gradual process of letting go of a lot of my life’s trappings, and committing to exchange things for experiences. It makes deep and abiding sense. It feels good and right in my body, the reservoir of wordless wisdom. And it comes. Remarkably quite easily. Ceasing blind urgency and habitual headlong over-ride and over-drive. Giving over to long moments gazing out the window into the now fully green trees. Pausing between paragraphs and pages of the latest book to wonder into white clouds suspended in signature azure skies. Going to bed earlier and sleeping later, serenaded by robins. Winnowing to essence. Quite a bit of not a lot. Mirroring for each other an innate way of being, born of aging. Darker now than winter even as the sun rises early. Muted edges of night time dreams give way to morning musings. Candle in the corner illuminates an altar of elements. A resting place of beauty. A pause for morning prayer. I am revived, in peace, home. Not every day, not every week, but enough mornings to know that rising early, before dawn, grounds me in the new day. Golden light on the emerald leaves of the laurel willow and last standing mayday. Birds singing for a new day – less now but in spring and early summer, the only sound that fills the still starry sky. Bob’s quiet voice, spoken word and song selections echo The Road Home. 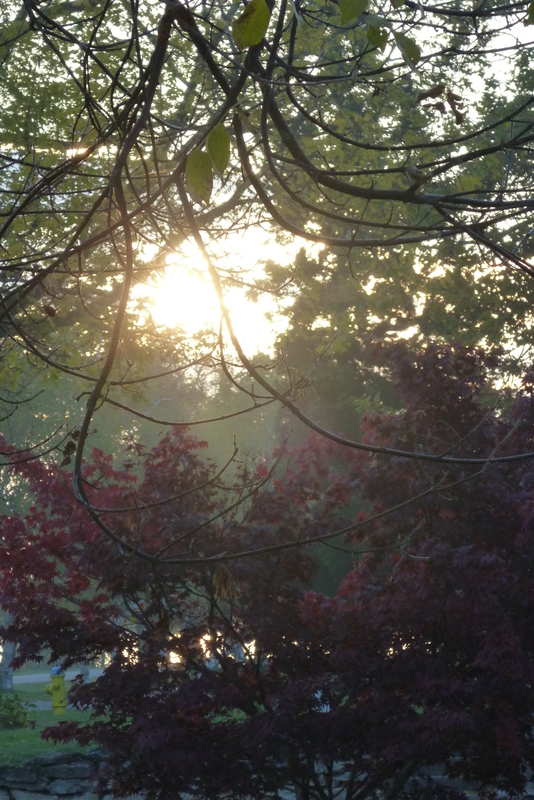 Morning breeze gently kissing awake the backyard trees, inviting them into the new day dance. Sister Moon’s sliver of shine gives way to the light of her Brother Sun. Still mind metta meditation for friends and family challenged by illness and travails. Full hearted prayer of thanksgiving for this Life, my Life, this new day. © Katharine Weinmann, 2018. All Rights Reserved. Original words and images on this site are copyright Katharine Weinmann at date of posting. You’re most welcome to contact me for permission to use.